Disney's Zootopia has become a box office sensation, taking in over $318 million domestically and $910.2 million worldwide since its release in early March. In case you didn't get a chance to see it in theaters, or just want to relive this animated comedy over and over again, Disney has announced that this blockbuster will be released on Blu-ray 3D, Blu-ray, DVD and Digital HD formats June 7. The studio has also released a new preview that breaks down several of the Disney Easter Eggs featured in this hit movie. The preview comes from the Disney Movies Anywhere YouTube page, which shows the ZPD "investigating" the numerous Easter Eggs and references to other Disney movies featured within Zootopia. This video reveals that the city of San Fransokyo, from Disney's 2014 hit Big Hero 6, is featured as the "City of the Month" on Chief Bogo's (Idris Elba) calendar. Big Hero 6's Baymax is even featured as an antenna topper in a scene. This video also breaks down the numerous references to Frozen, including two elephants wearing Anna and Elsa dresses, and much more. The modern mammal metropolis of Zootopia is a city like no other. Comprised of habitat neighborhoods like ritzy Sahara Square and frigid Tundratown, it's a melting pot where animals from every environment live together-a place where no matter what you are, from the biggest elephant to the smallest shrew, you can be anything. But when optimistic Officer Judy Hopps arrives, she discovers that being the first bunny on a police force of big, tough animals isn't so easy. Determined to prove herself, she jumps at the opportunity to crack a case, even if it means partnering with a fast-talking, scam-artist fox, Nick Wilde, to solve the mystery. Viewers will not only be able to enjoy the vibrant world of Zootopia and reunite with their favorite characters, but also discover more about the evolution of this extraordinary tale through in-depth bonus offerings. Features include candid conversations with filmmakers and artists behind Zootopia, an alternate opening, never-before-seen characters and deleted scenes and a sneak peek at some of the hidden Easter Eggs that make reference to Disney Animation's most beloved films and characters. The bonus features also include the "Try Everything" Music Video by Shakira, and the Digital HD version comes with an exclusive International Character Reel, where fans can see the variances in news reporters in Zootopia around the world. 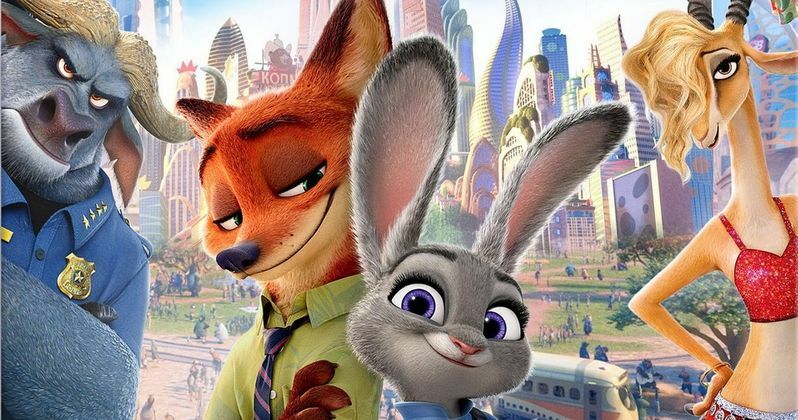 The Zootopia voice cast is lead by Jason Bateman and Ginnifer Goodwin as Nick Wilde and Judy Hopps, with Jenny Slate (Bellwether), Nate Torrance (Clawhauser), Bonnie Hunt (Bonnie Hopps), Don Lake (Stu Hopps), Tommy Chong (Yax), J.K. Simmons (Mayor Lionheart), Octavia Spencer (Mrs. Otterton), Alan Tudyk (Duke Weaselton) and Shakira (Gazelle) rounding out the cast. We also have the Blu-ray 3D and Blu-ray artwork for Zootopia, which you can check out below. Take a look at this Blu-ray preview below to learn more about the Disney Easter Eggs featured in Zootopia, and stay tuned for more on the Blu-ray as we get closer to the June 7 release date.